Hip dysplasia is often referred to as HD. HD occurs when there is insufficient stability to keep the "ball" within the "socket" of the hip joint. The hip joint then develops abnormally and the result is hind leg weakness, pain and functional disability. HD causes are considered complex as there may be many factors involved but the two most common are genetic and environmental. The selective breeding of dogs and health screening by the BVA/KC is therefore an important consideration for breeders. The other main factor is environmental such as the dog's weight, exercise and diet. Dogs being very overweight can increase the severity of the disease in genetically susceptible dogs. Carrying around extra weight will exacerbate the degeneration of the joints in a dog; including the hip. Dogs that may have been born genetically prone to hip dysplasia and are overweight are therefore at a much higher risk of developing hip dysplasia and eventually osteoarthritis. Another factor that may increase the incidence of hip dysplasia is rapid growth in puppies during the ages from three to ten months. Feeding a diet that has too much or too little calcium or other minerals can also have a detrimental effect on the development of the hip joint. Exercise may be another risk factor. It appears that dogs that are genetically susceptible to the disease may have an increased incidence of disease if they over-exercised at a young age. Exercise is good as long as it is moderate. Exercise that involves a lot of force to the joints whilst a puppy may have some bearing on some dogs being susceptible to HD later in life. HD can be tested as part of the BVA/KC health screening scheme. Dogs can be tested at a minimum of 1 years of age but there is no upper age limit and can only be scored once under the BVA scheme. From 1st January 2010 the dog must be permanently and uniquely identified by way of microchip or tattoo. A vet will take x-rays of the hips and these are sent to the BVA experts who "score" them. Hips are scored from 0 to a max of 106 (53 for each hip) the lower the score the better. Results are shown as a mean average breed score known as BMS ( Breed Specific Statistics) Currently there are not enough cockapoos being scored to show up on the table. 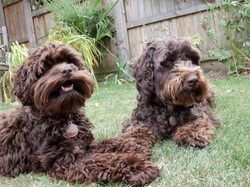 To ascertain a rough guide of what a cockapoo BMS should be aiming for would be to look at the parents breeds score and achieve a score that is equivalent or lower. Weight Management: keeping a dog at it's optimum weight level. Exercise: Usually tailored to your dogs specific needs taking into consideration dogs age. weight and level of pain and function. Hydrotherapy: Swimming for dogs with a tailored programme by qualified professionals. Surgery: Will depend on dogs size and severity of the hips joint's degeneration. Albie is our 19 month old chocolate Cockapoo (English Show Cocker/Miniature Poodle) who we rehomed when he was just 10 weeks of age in August 2010. Unfortunately “Oscars” 1st owners decided to rehome him due to family illness and redundancy. “Oscar” became Albie and he started his new life with us. Despite his rough start to life Albie settled in straight away with us. The only health problems we had with him were settling his stomach and getting him off the poor diet he was on previously being Bakers Complete! It was going straight through him and I now wonder if this poor diet at such a vital stage of his development contributed to what was to come the following January. We moved him over to Burns and it took about 6 months to achieve what I would call a “normal” stool and also to get weight on him. Over Christmas of 2010 my step daughter came to stay and noticed that Albie was limping on his left hind leg. We put this down to him playing too boisterously with his best friend Barney or maybe that he had fallen on the ice as the weather was atrocious. We put him down to two short lead walks for 10 mins a day but by the New Year it was getting worse. It was also taking a bit of an effort for him to heave himself up after sleeping; the best way to describe this was that he was like a stiff old dog not a vibrant 6 month old pup. We took him to the vets who gave him a thorough examination and did numerous manipulations of his legs and finally his hips which caused him to whimper. The vet warned us about the possibility of hip dysplasia as both Cocker Spaniels and Poodles can suffer with this affliction but that to confirm this it would require an x-ray. We were given some pain killers and anti-inflammatories for 2 weeks and he suggested that if this didn’t help that we castrate Albie and x-ray his hind quarters at the same time. He also suggested moving Albie into the hall at night from the kitchen so that he wasn’t on the cold hard floor as it may have been making the stiffness worse. 2 weeks later we hadn’t seen much improvement so we booked Albie in for his castration on the 14th Jan 2011. He came through the op fine but we were called in to discuss his x-rays. I remember posting on a Cockapoo forum that I hoped it wasn’t hip dysplasia, unfortunately my worst fears were confirmed. Although it was quite upsetting to know that our baby was in pain and had this condition we were all really positive that with this action plan that one day we would have our happy healthy dog back. However a 6 month old puppy only getting 2 short lead walks a day was really tough at first. Over time though he did get used to it and we did lots of training with him in the house instead to keep him occupied. Hydrotherapy was definitely the biggest break through for us and we were extremely lucky to find a fantastic centre and such lovely people at Petlodge in Whitstable Kent. For the first four or five sessions Albie went on their Canine Aquatic Treadmill which provides exercise in a controlled environment where both the levels of water and speed of the treadmill can be varied. This provides dogs with low impact exercise. By altering the water levels both flexion and extension of specific joints can be targeted and treated effectively. Albie was not a very big fan of this, he would cry and try to sit down but I think this was due to the fact he found it such hard work at first as he had such poor muscle tone. Linda the hydro therapist gave lots of good advice like doing lots of uphill walking with him to help build up his muscles. After these sessions which started off twice a week, the big day for a proper pool swim finally arrived. Due to his displeasure on the treadmill and his general avoidance of puddles on his walks I wasn’t sure how he would take to the pool. However to my delight he took to it like a duck to water! I was such a proud mum. For the first few months he would wear a special harness so that Linda could take his weight and leave him to concentrate on his swimming. He made good progress and over time his sessions reduced to once a week, then once a fortnight and finally to once a month. I cannot recommend hydrotherapy enough and we were very lucky to have such a fantastic centre with some of the best facilities in the country. By the April of 2011 we were able to take Albie on holiday with us to the new forest and he was back off his lead and able to go for some longer walks again. By the end of his sessions in November 2011 (22 in total) he would leap into the water from the ramp and could swim after toys and fetch them back. We both miss everyone there especially Buttons the Sheltie who Albie fell in love with! We also now have a dog who loves to jump and run through muddy puddles – thanks Linda! Albie will never be completely cured of his hip dysplasia and we know to be very careful with him. Obviously in the future we will no doubt have some setbacks. It may be necessary that he has to have ball joint replacement surgery but we would prefer to avoid this if possible. Arthritis is a big concern but knowing we have Petlodge to go back to as and when needed is a great comfort. Finally I cannot stress enough the importance of having good insurance cover. One of the reasons we got Albie was that he was mixed bred and we were hoping that he would be at lower risk of these types of conditions. Thankfully we purchased the best insurance we could afford and we are able to claim up to £1000.00 of alternative therapies for him. Each session of hydrotherapy costs £25.00 but I would say it’s been the best £500.00 we could have spent and we can claim this back now. I could spend all day thinking about why my boy has this condition and whether there something we could have done differently or that he was just unlucky? But to look at my gorgeous boy now you would never know day to day that he has this problem and we are truly blessed with such a lovely natured and fun dog. Thanks to Kirsty for sharing her Story with us. Albie now has a playmate as Tilly joined the family.